In came the Haggis held aloft by the Savoy Park head chef David Gibson, through the standing assembled company at a slow and stately pace accompanied by ‘A Man’s a Man for A That’ on the pipes, resounding to synchronised clapping of the audience, in the packed room at the Savoy Park Hotel. Thereafter, Alistair Tyre masterfully addressed the “great chieftain o’ the puddin’ race”, just managing to avoid chef David with his trusty dirk. 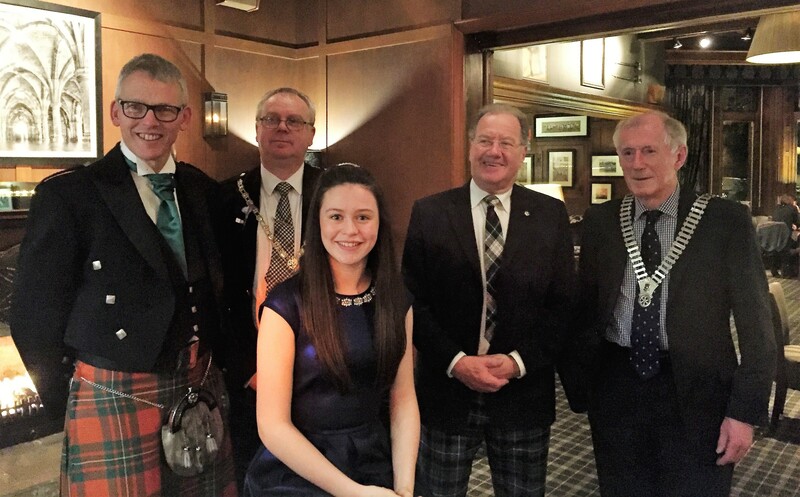 And then, the large audience were treated to the delightful and highly entertaining Sophie Craig, a Wellington School pupil, who sang two numbers including “Whistle and I’ll Come to Ye Ma Lad.” Sophie had performed in front of 400 guests the previous week in the Glasgow Hilton which hosted A Celebration of Burns on behalf of The Prince & Princess of Wales Hospice. A thoroughly enjoyable night, complimented by tasty Scottish fair from the Savoy Park kitchens, delivered with the usual high standard of service. Secretary Craig Wilson gave the vote of thanks.